While the Pan Am Games do not offer the same marketing value for competing athletes as the Olympics do, the added attention provided a great platform for athletes to showcase their abilities and introduce themselves to the Canadian public. It also provided brands with a chance to scout athletes that could potentially be used in endorsement deals leading up to next summer's Olympics in Rio de Janeiro. This week the Pan Am and Parapan Am Games came to a close, completing over a month of exciting athletic competition. Despite initial public scrutiny over the Games, the Pan and Parapan Am Games were very well received in Toronto and throughout the country. The Pan Am Games undoubtedly received increased attention from fans and corporate sponsors as a result of being hosted in one of the largest media markets in North America. While the Pan Am Games do not offer the same marketing value for competing athletes as the Olympics do, the added attention provided a great platform for athletes to showcase their abilities and introduce themselves to the Canadian public. It also provided brands with a chance to scout athletes that could potentially be used in endorsement deals leading up to next summer's Olympics in Rio de Janeiro. Coming out of the games, a few athletes made the most of their competition time and stood out at the games. With over 300,000 Canadian youth participating in, Black has emerged as the face of one of the country's largest grassroots sports. Black was one of only two five-medal winners at this year's Pan Am Games, and her haul included three gold medals. At 19 years old, Ellie Black is in the prime of her gymnast career. Coming out of the 2012 London Olympics, U.S. gymnasts like Gabby Douglas and Aly Raisman emerged as some of the biggest Olympic stars, going on to ink deals with brands like Kellogg's. Black could potentially achieve a similar status in Canada. De Grasse has been called the future of Canadian track and is expected to compete at the 2016 Olympics. De Grasse can be highly attractive to marketers as sprinters tend to become some of the more recognizable athletes that emerge from Olympic Games. In Canada, sprinters like Donovan Bailey still remain household names. 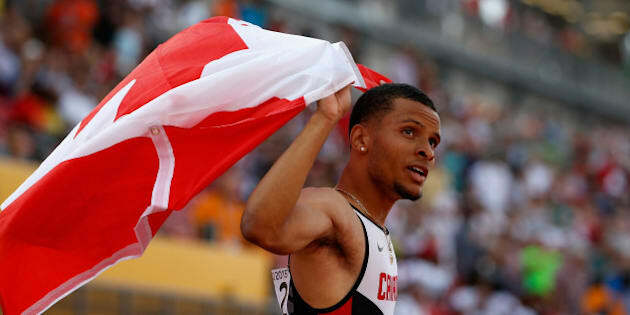 During the Pan Am Games, De Grasse won the 100 meter and 200 meter races proving his potential. Watch for him to be a likely target for Canadian sponsors entering Rio next summer. Canada`s wheelchair rugby team took home gold at the Parapan Am Games and Zak Madell was a large part of that victory. The 21-year old scored 34 goals in the final game beating the Americans 57-54 to ensure Canada`s spot in next year`s Olympics. After the win, Madell was quick to deflect any praise sent his way. His team-first attitude and elite play contributed to his pick as the flag bearer for Canada during the closing ceremonies. Madell has been featured in online content for Sport Chek and has been active on social media throughout the game. He brings a media savvy and experience as a sponsored athlete to the table for a prospective brand. Emily Overholt is a 17-year-old swimmer from British Colombia who has a bright future in the sport. At the Pan Am Games, Overholt won gold in the 400 m freestyle and silver in the 200 m freestyle. Overholt finished first at the 400 m individual medley at this year's Pan Am games but she was later disqualified after it was found that she did not touch the wall simultaneously with both hands. Her resiliency to bounce back and earn another medal endeared her to the Canadian crowds and lead to a number of media profile opportunities that gave her a chance to greet the Canadian public outside of the pool. Canada is steadily becoming more known as a basketball nation and Jamal Murray is the latest high-profile basketball player to come out of Canada. He will attend the University of Kentucky next year, a top-tier school in the United States that is known for preparing prospects for the NBA level. Murray will not only have a long future with the Canadian national team, but he is currently projected as a top-10 draft pick in the 2016 NBA Draft. At the Pan Am Games, Jamal Murray led the Canadian team to a silver medal finish, upsetting the American team along the way. As Canada's NBA talent like Andrew Wiggins and Tristan Thompson continue to expand their sponsor roster, Murray may represent the next endorser-of-choice for brands seeking to capitalize on the Canadian basketball renaissance. The athletes at the Pan Am Games were given an opportunity to build their reputation before next year's Olympics, something not typically afforded to Pan Am athletes. Corporate sponsors will be closely watching the road to Rio during the next year, monitoring the performance of potential endorsers. Thanks to the Pan Am Games, many of these athletes have been granted a platform to get on the radar of Canadian brands earlier than usual.